It can seem almost impossible to stay healthy while snacking or as if all the healthy snacks you see recommended have some form of meat. I wanted to highlight some high protein snacks that vegetarian, easy to make and great to eat at work! Occasionally, I will see some really awkward snack ideas that, while healthy, take a long time to put together and/or seem messy to eat at your desk. I hope you enjoy my suggestions and please let me know your favorites! Greek yogurt is hands down my favorite go-to snack. The yogurt pictured above is actually an Icelandic style yogurt by Siggis brand, but has all the attributes of a quality Greek yogurt – a high protein and low sugar snack, which can be enjoyed by everyone. Although I love both cashew nuts and strawberries on their own, pair them together and you’ve got yourself a powerhouse of a snack! Strawberries are fantastic with a number of beneficial vitamins and minerals as well as being fairly low in sugar, for a fruit. Cashews are high in protein; 1oz of cashew nuts provides 5g of protein! Furthermore, this is a snack that can be taken anywhere with ease. I’m really lucky that my work place has a seemingly never ending supply of string cheese, which is a great low-carb snack option. I like pairing it with almonds (be aware of serving sizes) to make it a more satiating snack that will keep me full for several hours. Mmm, this is one of my personal faves and is normally a go-to breakfast or snack. Try out my pumpkin spice smoothie to get in a serving of veggies as well as a hit of protein. To bring it to work, just store it in a mason jar (or any airtight container) and pop it in the fridge at work! I have to say, this is not something I have had recently – I feel like I forget about it as weird as that sounds! This is a really simple snack that helps you get in all of your macronutrients. If you are not a huge fan of rice crackers, try a high fiber cracker like Wasa. Hummus is fantastic and full of health benefits! Hummus is made with chickpeas, which are a great source of complex carbohydrates, protein and fiber. 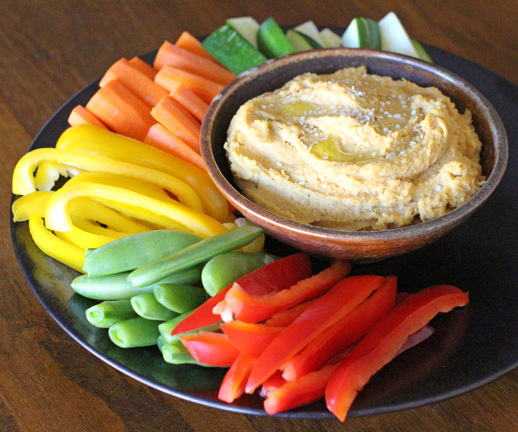 It’s easy to make at home but hummus is readily available at supermarkets. Pair it with some chopped bell peppers, cucumbers or even celery for a satisfying snack. Quest bars are my absolute favorite high protein bar – they are also high in fiber and low in sugar, which make them a perfect mid morning or mid afternoon snack. My favorite flavors are cookie dough and cookies and cream. Avocado toast on it’s own is honestly already a great snack, but the toasted sunflower seeds add extra flavor and satiety. Avocado is rich with healthy fats and fiber and sunflower seeds add in some protein to make this snack keep you full (and your tummy happy) for hours. Um, YUM! Healthy cookie dough, it’s weird to even say that, isn’t it? Like our friend, Mr. Hummus, this healthy cookie dough is made with chickpeas – the secret healthy ingredient. Head over to POPSUGAR to get this simple recipe. Instead of buying trail mix, which is often loaded with sugar, why not make your own! Simply mix in chopped Medjool dates, blueberries, pumpkin seeds and walnuts. Put your healthy trail mix in a ziplock bag and bring to work. Done! I hope my high protein snack list helps make your healthy lifestyle a little bit easier and has given you some fun new things to try. I know I get bored easily and it helps to have a list of several different options to choose from. Which snack will you try first? *For more from Alice, be sure to visit Honestly Fitness.